QT-Wave Patrik Diethelm Windsurf Boards. QT-Wave Patrik Diethelm Windsurf Boards. A wave shape with a huge range of performance. Derived from the all wave board “Campello Wave”. A wave shape with a huge range of performance. Derived from the all wave board “Campello Wave” we worked on improving the balance while testing different width to thickness ratios. The slightly wider and thinner shape is more stable and improves the performance in non-perfect conditions. To keep the maneuverability as it was we increased the tail kick and reduced the tail width while adding a winger. The final result is a very polyvalent design which in combination with the 5 fin boxes excels in ease adapting to changing conditions. Offering 8 sizes from 68 up to 113 liters makes this range very complete.The PATRIK QT-Wave is the first Quad in our product range. Ricardo is convinced in the function of four fins because they give more grip in radical turns. 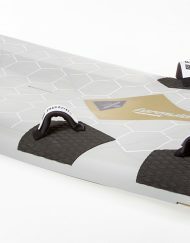 The five sizes cover the entire wind range that a board like this would be suitable for. The concept of all QT-Waveboards is very much the same. 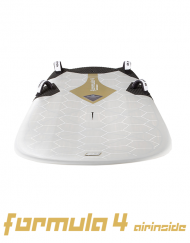 The smallest board, the QT-Wave 69 is designed for maximum control in strong winds, as you move up the sizes the shape has been finely tuned to optimize your get-up-and-go with an ability to plan fast and free across the waves.